Copyright and published with kind permission of the National Railway Museum. The Rocket represented a major leap forward in locomotive design. It combined many new features and formed the standard for almost every steam locomotive that followed. The Rocket powered the first ever passenger transport service and had a working life of 67 years. This section describes the history of the Rainhill trials, where it first appeared, and details some of the developments in its life. Prior to the Rocket, steam engines had only been used as stationary engines or for pulling coal. Average speeds were only 4-6 miles per hour and even then the locomotives only operated over short distances and were not capable of carrying significant loads up hill. Conventional boiler designs only allowed the engines to build up steam slowly. This meant that once the locomotive had raised pressure and made a short trip, it then had to wait the fire to raise sufficient pressure again. Most loads at the time were pulled using a stationary engine with a rope to pull the carriages. Many people felt that this method of rope haulage was the way of the future and after several reports and much discussion, the directors of the Liverpool and Manchester Railway (L&M) could not decide which method to adopt for their new Railway. 'a premium of £500 to be advertised for a Locomotive Engine which shall be a decided improvement on those now in use, as respects the consumption of smoke, increased speed, adequate power, and moderate weight, the particulars of which shall be specified in detail by the Preparation Committee' . Such improvements were thought to need speeds of at least 10 miles an hour maintained for at least 3 hours. A marked improvement on the technology available at the time. On which the Directors of the Liverpool and Manchester Railway offer a Premium of £500 for the most Improved Locomotive Engine. l. The said Engine must 'effectually consume its own smoke', according to the provisions of the Railway Act, 7th Geo. IV. ll. The Engine, if it weighs Six Tons, must be capable of drawing after it, day by day, on a well-constructed Railway, on a level plane, a Train of Carriages of the gross weight of Twenty Tons, including the Tender and Water Tank, at the rate of Ten Miles per Hour, with a pressure of steam in the boiler not exceeding Fifty Pounds on the square inch. lll. There must be Two Safety Valves, one of which must be completely out of the reach or control of the Engine-man, and neither of which must be fastened down while the Engine is working. lV. The Engine and Boiler must be supported on Springs, and rest on Six Wheels; and the height from the ground to the top of the Chimney must not exceed Fifteen Feet. V. The weight of the Machine, with its complement of water in the Boiler, must, at most, not exceed Six Tons, and a Machine of less weight will be preferred if it draw after it a proportionate weight; and if the weight of the Engine, etc., do not exceed Five Tons, then the gross weight to be drawn need not exceed Fifteen Tons; and in that proportion for Machines of still smaller weight - provided that the Engine, etc., shall still be on six wheels, unless the weight (as above) be reduced to Four Tons and a Half, or under, in which case the Boiler etc., may be placed on four wheels. And the Company shall be at liberty to put the Boiler, Fire Tube, Cylinders, etc., to the test of a pressure of water not exceeding 150 Pounds per square inch, without being answerable for any damage the Machine may receive in consequence. Vl. There must be a Mercurial Gauge affixed to the Machine, with Index Rod, showing the Steam Pressure above 45 Pounds per Square inch; and constructed to blow out a Pressure of 60 Pounds per inch. Vll. The Engine to be delivered complete for trial, at the Liverpool end of the Railway, not later than the 1st of October next. Vlll. The price of the Engine which may be accepted not to exceed £550. delivered on the Railway; and any Engine not approved to be taken back by the Owner. N.B.- The Railway Company will provide the Engine Tender with a supply of Water and Fuel, for the experiment. The distance within the Rails is four feet eight inches and a half. In 1929 George Stephenson was the engineer for the L&M and was also a partner with his son in the firm Robert Stephenson & Co. He was the most experience locomotive designer in the country and had already built some of the most advanced machines of the time. Henry Booth also made a vital contribution to the Rocket's design by suggesting the use of a multi-tube boiler instead of the usual single pass or twin flue designs. Stephenson combined this with an exhaust steam blast jet to increase the air flow through the fire, relative to the engine speed. These two features were not new but had never been used on a locomotive before; history has shown however, that they have been used on everyone designed ever since. Another key feature of the Rocket design was the use of 2 non-vertical cylinders with direct drive to the wheels using 90 degree cranks. At the time manufacturing processes were not very advanced and the simple, non-coupled design probably improved the free running at speed. Four steam engines and one horse-propelled carriage were put forward for the competition which was held on October 6th 1929. The 'NOVELTY' of Messrs. Braithwaite and Erickson weighed in at 2 tons 15 cwt and was a new concept in locomotive design. The 'SANS PAREIL' of Mr Hackworth weighed in at 4 tons 8cwt and was a based on a development of existing technology. The cylinder castings had been manufactured by Robert Stephensons and when they failed during the trials Mr Hackworth claimed sabotage. It appears however that Mr Hackworth had first choice of the twelve different castings that were made for the Rainhill trials. The 'CYCLOPED' weighed 3 tons but was pulled by a horse. The 'PERSEVERANCE' weighed only 2 tons 17cwt but was essentially a modified road steam carriage and had not been adapted for rail service at all. TRIAL OF THE LOCOMOTIVE ENGINES, LIVERPOOL & MANCHESTER RAILWAY. The following is the ordeal which we have: decided each locomotive engine shall undergo in contending for the premium of £500 at Rainhill. The weight of the locomotive engine, with its full complement of water in the boiler, shall be ascertained at the weighing machine by eight o'clock in the morning, and the load assigned to it shall be three times the weight thereof. The water in the boiler shall be cold, and there shall be no fuel in the fireplace. As much fuel shall be weighed, and as much water shall be measured and delivered into the tender carriage, as the owner of the engine may consider sufficient for the supply of the engine for a journey of thirty-five miles. The fire in the boiler shall then be lighted, and the quantity of fuel consumed for getting up the steam shall be determined, and the time noted. The tender-carriage, with the fuel and water, shall be considered to be, and taken as part of the load assigned to the engine. Those engines that carry their own fuel and water shall be allowed a proportionate deduction from their load, according to the weight of the engine. The engine, with the carriages attached to it, shall be run by hand up to the starting-post, and as soon as the steam is got up to fifty pounds per square inch, the engine shall set out upon its journey. The distance the engine shall perform each trip shall be one mile and three-quarters each way, including one-eighth of a mile at each end for getting up the speed, and for stopping the train; by this means the engine with its load will travel one-and-a-half miles each way at full speed. The engine shall make ten trips, which will be equal to a journey of thirty-five miles; thirty miles whereof shall be performed at full speed, and the average rate of travelling shall not be less than ten miles per hour. As soon as the engine has performed this task (which will be equal to the travelling from Liverpool to Manchester), there shall be a fresh supply of fuel and water delivered to her; and as soon as she can be got ready to set out again, she shall go up to the starting post and make ten trips more, which wi11 be equal to the journey from Manchester back again to Liverpool. The time of performing every trip shall be accurately noted, as well as the time occupied in getting ready to set out on the second journey. Should the engine not be enabled to take along with it sufficient fuel and water for the journey of ten trips, the time occupied in taking in a fresh supply of fuel and water shall be considered and taken as a part of the time in per- forming the journey. Judges:- J. U. Rastrick, Esq., Stourbridge, C.E., Nicholas Wood. Esq., Killingworth, C.E., John Kennedy, Esq., Manchester. Some 12,000 to 15,000 people turned up to watch the Rocket on each day of its trials and the results made front-page news around the world. The Rocket was far and away the best performing locomotive and was the only one to satisfy the requirements set by the Judges. In fact it exceeded the specification in every way. The 'Cycloped' and 'Perseverance' soon withdrew from the competition. 'Sans Pareil' suffered from mechanical problems. Only 'Novelty' made a real attempted to meet the challenge but was no match for the Rocket. On the first day of official testing the Rocket was loaded with a total of 13 tons including the tender, 255 kg of coke and 1364 Litres of water. 10 consecutive runs were made along a 1.5 mile, flat course with 220 yds at each end for accelerating and decelerating. The total distance of 35 miles was equivalent to the distance between Liverpool and Manchester (the full track had not yet been laid) and was completed in a total of 3 hours and 10 minutes. An average 11 mph including stops. After a 15 minute stop for more water and coke an additional 10 return trips were made with the same load. This was completed in 2 hours and 10 minutes giving an average speed of 12.2 miles per hour. It was noted at the time that had the journey been continuous there is little doubt that an average speed of 15 miles per hour would have been reached. It was recorded at the time that the Rocket took 57 minutes to heat up from cold and over the 70 mile run consumed 1,085lb (492kg) of coal. The Rainhill trials represented some of the first runs that the Rocket ever made. It's performance was by no means fully developed and during the trials it was probably felt better to achieve a good finish than risk any damage by driving to fast. Shortly after the trial Stephenson continued with further testing and reported that on a level they had pulled 30 tons at an average speed of 13 mph. Over 1.5 miles of 1 in 96 incline the Rocket averaged 16 mph and could still pull 13 mph with a load of 13 tons. 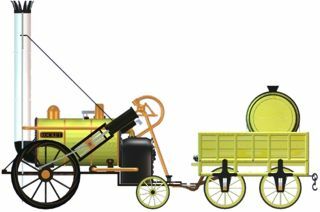 Without exceeding the 50psi limit Stephenson achieved unloaded speeds of 37 mph and straight after the trials old George regularly took trips of 40 people up the Rainhill 1 in 96 incline at speeds of 20 mph. Although the Rocket remained in work for some 67 years it by no means kept the same design. In fact even during the trials it was being modified and upgraded to improve its performance. The size of the exhaust jet orifice in the blast pipe was the subject of much tuning to obtain the best efficiency. It's effect was quite visible by the amount to fuel that was emitted from the chimney. The original wheels were the traditional wooden designs of the day. In fact these must have been the only non-experimental designs on the locomotive. Later, cast iron wheels were used, as these would be better able to withstand a derailment. It is now believed that the dome was not fitted to the original engine but was added later to reduce the amount of water entering the cylinders due to splashes caused as the locomotive moved. It was soon noticed that the cylinders caused a 'jumping movement' against the springs as well as restricting the movement of the driver and fireman. The cylinders were soon lowered to only 8 degrees and remained in this position on all of the other Rockets that were produced. Another significant improvement was the addition of the smokebox on the front of the Rocket. The early design had only a small hand hole in the chimney base from which a plate had to be removed in order to clean out the cinders. The first Rockets had no brakes and forward and reverse was selected by standing on a selector arm built into the floor of the footplate. This lever operated a basic eccentric gear change that although very hash, could and should be changed on the move. In fact on the opening day of the trials Mr Huskinsson, a local MP, was knocked down and killed by the Rocket. It is likely that this was a result of everyone's enthusiasm to see the Rocket along with the inexperienced driver's great difficulty of being able to hold a locomotive without brakes and only a very sudden gear change. Because the pace of development was so fast with the early locomotive design, the Rocket was never produced in any great numbers. The following year Stephenson produced the Northumbrian with a full smoke box, integrated boiler and firebox and horizontal cylinders. Then in the same year he produced the Planet with cylinders inside the wheels and facing backwards to drive on a crank-axle shaft. The planet spawned many copies around the world and the fundamental changes that occurred in locomotive designs in the first ten years are not that much different to those that occurred in the first 100 years. The only significant developments that changed from Stephenson's original concept were the use of compound cylinders on some engines, variable cutoff valves and smoke box superheating. The original Rocket has now been restored and is kept in the Science museum in London. It still shows many of the modifications that have be added during it's life. Several replicas of the original design have been built and the National Railway Museum at York run their engines at regular public displays around the world. Free public rides are given on several days throughout the summer at York.